It's easy to think that there's nothing to foyer design except a door and a hall but just think about how often someone (or some stuff) goes in and out of your home. It’s a very high traffic and high use area. You can cut down on a lot of clutter in your home with well designed entry foyer spaces. On this page we take a look at the activities of coming and going and look at what features make for good entry design. This page is part of the room design series. Let's get straight down to business and start with some foyer designs then we'll move on to the explanation. 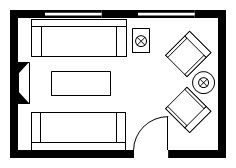 This 8ft x 8ft (2.44 x 2.44m) entry foyer includes a large closet (sliding doors to prevent door swing issues), a window to see outside (ensure adequate security measures), a table for set down of post and keys, a wall opposite the door which could accommodate a bench, or a console table, or a bench with a niche behind it for 'home tone display'. The second door leads into the rest of the home creating both privacy and an airlock. 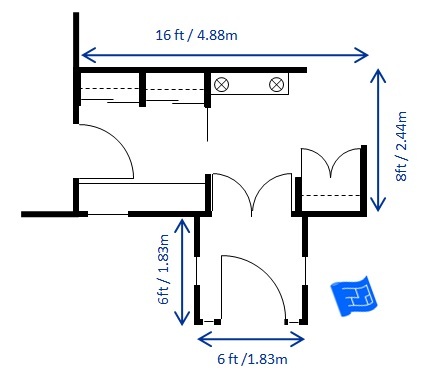 This small 8ft x 4ft entrance space has the essential closet and the space to the right of the door could be used as a set down space or a small bench. 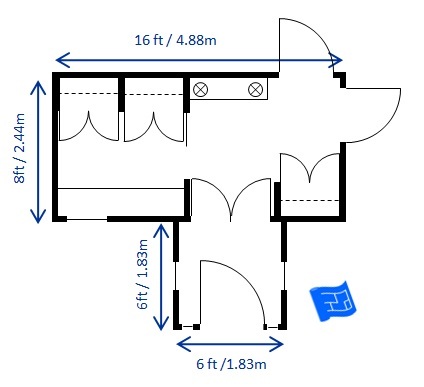 The opposite wall is very close to the door swing but this is alleviated by the corridor space to the right. Doors could be added a small distance down the corridor if an air lock is important. Here's a grand entrance that incorporates a mud room to the side. If the area needs to receive guests more formally the sliding door to the mudroom can be closed and the extra closet to the right can be used for hanging guests' coats. Guests wouldn't even know that the mudroom is there. The porch area creates an air lock and creates an interesting entry sequence. With a few changes to this entrance layout we can see some other interesting possibilities. In this foyer design I've shown how things might look if there was a garage at the side of the home or an entrance leading in from the side of the house without a garage. The mudroom does double duty from both the front and rear entrances. Householders coming and going. Perhaps this includes kids and adults who might have varying needs in terms of storage. Are any pets involved? What stuff do you carry in and out of your home (keys, groceries, sports equipment, school bags, post etc). 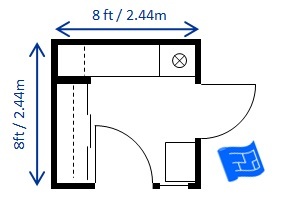 One entrance or a formal entry and a back door? OK - so maybe the door isn't always at the back of the house but you know what I mean. Some homes have a 'front door' which is used for guests and maybe the post man, and then the rear entry that all the householders use on a daily basis. If you have more than one entry what activities will take place in each entry space? So, as with the rest of the room design pages, let's take a look at the design features that go into a good entry foyer design. The foyer should have it's own sense of space and shouldn't open on to living areas or be doubled up as a laundry room. The best entry spaces are completely separate from the rest of the home and don't form part of the circulation space around the home, just coming and going. The entrance shouldn't take away access to light from any main living areas. The location of the entry should make sense with the location of the parking. There must be relevant storage for the activities that go on in the entry space. If there is no closet built in, there should be room for a big wardrobe. A seat (chair or bench) is a great asset in an entrance space. An air lock often makes sense to preserve heat (or cooler air). An air lock is where there are two doors to the entrance where the idea is that neither of them are open at the same time which prevents the air that's in the house from escaping too much. The entry door shouldn't swing into the door swing of any other doors - including the closet doors. Ditto for chandeliers. You need to be able to see who's at the door - maybe through a window, a peep-hole or a camera. For me the best entry spaces have a wall which greets those entering which can be used to set the tone of the home with the decor, creates privacy and requires a change in direction of circulation. This makes the entry sequence more of a journey, more of an event. Make sure any steps are visible. Often there is a step over or a step up over the threshold of the door. 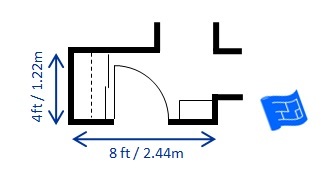 If further steps are required to reach the level of the house make sure they are in an obvious place rather than a spot that's a tripping hazard. What's with the stairs in the hall the whole time? Many of the homes I've lived in had the stairs coming down the the hall beside the main entrance. I often found myself wishing I didn't have to walk right past the entrance to take the stairs. It's as if I have to move through a very public area to move around the house.